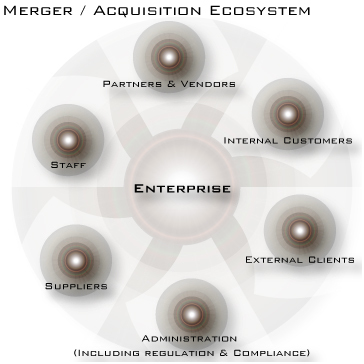 It is hard to name many business transactions that are as risky and complex as mergers and acquisitions (M&A). Yet, when M&A transactions are approached with an understanding of the risks and challenges involved, along with careful due diligence and thoughtful planning; organizations can thrive in a post-merger or acquisition environment. That is where Samson Communications can help. By working closely with the buyer (acquirer) or the seller (firm being acquired), we significantly enhance the probability of success for all concerned. Post M&A statistics are bad...so what goes wrong? Most businesses contemplating an M&A transaction do not realize that over 85% of M&A deals fail, according to a recent KPMG study, and that the total return to shareholders on 115 global M&A transactions was negative 58%, according to another study by A.T. Kearney. What does this mean to you? M&A deals boil down to results. Our approach leads to clearer vision of the M&A outcomes, better strategy to accomplish them, accountability for performance during the process and ultimately for effective execution of the deal. Simply stated, the Samson process enables organizations to complete M&A transactions with highly successful outcomes by mitigating risks, planning the details and managing execution to deliver the desired results.